I wondered how and why this press came to be, so I asked him a few questions to find out. See my interview with Olsen and a link to their submission guidelines below. OLSEN: We are a small press just starting out, though we do have big dreams. The idea started with me and now I’ve got some great folks on board, but we are still working out the roles for everyone. As a press we are focused on being a place for the poet and artist still lurking in the shadows to be heard. We are going to publish well-crafted, engaging poetry and art from both unknown and known poets, writers, and artists. Our goals with publications are 50% poetry, 25% writings and 25% art. 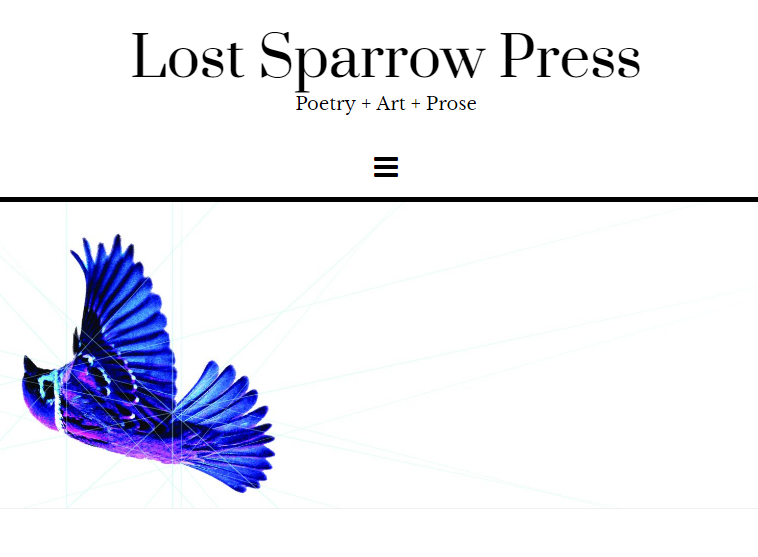 HOPKINSON: How/why was Lost Sparrow Press originally started? OLSEN: I have an affinity for books, and over the years I have been lucky enough to come across some weird, interesting, and great poetry collections in a variety of places, often thrift stores and coffee shops, and the idea of doing it myself just grew from there. The idea started small and has now snowballed into a moveable object. OLSEN: Poetry, art of all mediums that can be printed, and writings, short-stories, and you can always check out our submission guidelines online. We have two submissions open on two upcoming publications. ‘The Lost Sparrow’ is themed “Spring.” We are leaving it open to interpretation on what spring means to you. ‘Porcupine’ is even more open, we are looking for your best work on current themes coursing through society right now. OLSEN: The one that started this whole adventure, that I picked up in a thrift store, is Kayak, it was put out by George Hitchcock, who ran it by himself in the sixties to the eighties; it’s great, I am always on the lookout for more copies. Also, I really enjoy local, small scale works, stuff you find at zine fests, pinned to coffee shop walls, and peddled on the street. Right now I am in Utah so locally Orogeny is a put out by a good group of folks, and nationally I really enjoy Tin House, and Three Penny Review. OLSEN: At the bottom of our about page there is a contact form or the trusty gmail at lostsparrowpress@gmail.com. Have you ever thought about compiling a list of free online writing workshops? If not, can you please think it over? I know it would be a great help to me and several others! Thank you for the suggestion! I have posted about free writing workshops when I see them, but I haven’t compiled them into a list per se. That’s a great idea! I’ll add it to my list :). Thanks Trish! I was searching online last night and I ran across thecraftywriter.com and I discovered that they have a few free writing workshops available on their site. Cool, thanks for sharing that link. I was finding their site a little tough to navigate and didn’t have much time.